National Machinery Exchange specializes in extrusion presses for brass, copper, stainless steel, aluminum and precious metals. 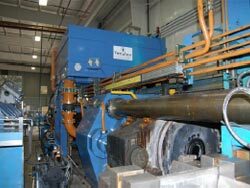 We've handled direct and indirect extrusion presses from 300 ton to 10,000 tons. Presses have ranged from oil hydraulic to water presses. In addition, to full press lines, we also specialize in extrusion press support equipment from billet saws, age ovens, handling systems, piercing presses, die ovens and age ovens, stretchers, pullers, finish saws, hot saws, billet heating systems, cooling tables, and more. We can also assist Impact extrusion for aluminum cans, cylinders, and tubes from impact presses, coaters, accumulators, washers, necking units to complete impact extrusion lines. Contact us with all your extrusion machinery needs.